With the Terminator, we can offer a green alternative to floor demolition. The Terminator is an electric/battery powered machine that allows for a quiet, zero-emissions demolition. 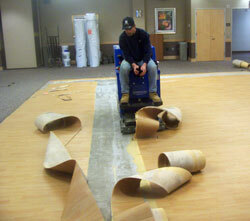 Our Terminator machine will make demo of your old flooring both clean, quiet and easy. Floor removal is completely performed using mechanical methods and no chemicals. Our trained employees and hi-tech equipment have the power to get the job done at a fraction of the time and expense associated with conventional methods.